Tired of Facebook groups because they have too many complicated rules? I hear ya! Our group is the complete opposite. Feel free to post about whatever excites you, as long as you respect one another. Have a question for me? Enjoy instant access to answers by using #AskDerek within the group. Join the public group for free now. Click or tap here! 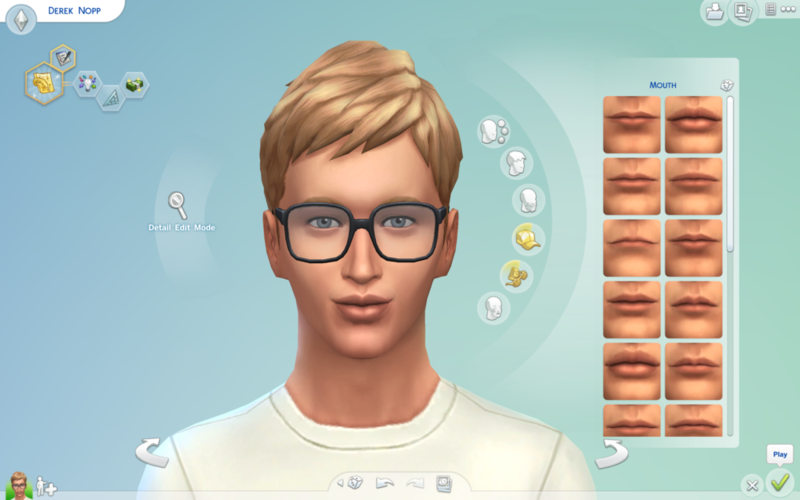 Speaking of Jake, here’s the Sim I made of him. Yes, I know, I know, I’m kinda basic. I made Sims us and that’s who I’ve been playing as. BA-SIC. I have very selective taste in video games, and The Sims series = some of the only games I play. When I say that, I mean it. My husband Jake and I have had a PS4 since July of last year, and I still haven’t bought a game of my own for it! Meanwhile he has a few, of course. Just try to stop that man from gaming. Just try! Anyhoo, the point is The Sims games have been the cornerstone of my gaming career, and the series is by far my favorite. I have played The Sims, The Sims 2 and The Sims 3 and various expansion packs (man, do they get you on those!) extensively since I was a wee little preteen. While I was creating a Sim based on my own visage (ooh, don’t I sound all fancy? ), I accidentally gave myself this nose. I wish I looked that hot. I mean, day-umm. Whereas The Sims 3 wasn’t all that different from The Sims 2, The Sims 4 is a large jump. Things are in different places. Build and Buy mode are merged. Create a Sim is CRAZY customizable (and therefore AMAZING). In The Sims 4, you literally pull on the facial and bodily features of the Sims to change their shape and size. I’m running this on the new lightweight MacBook meant for casual use, and the game is still performing very well. Granted, I put it on the lowest graphic settings, but it’s just gorgeous and still so detailed. I’m really impressed! Everything aesthetically is a big and beautiful jump ahead from The Sims 3 (my previous fave). Gurls and boyz, this game is FUN. 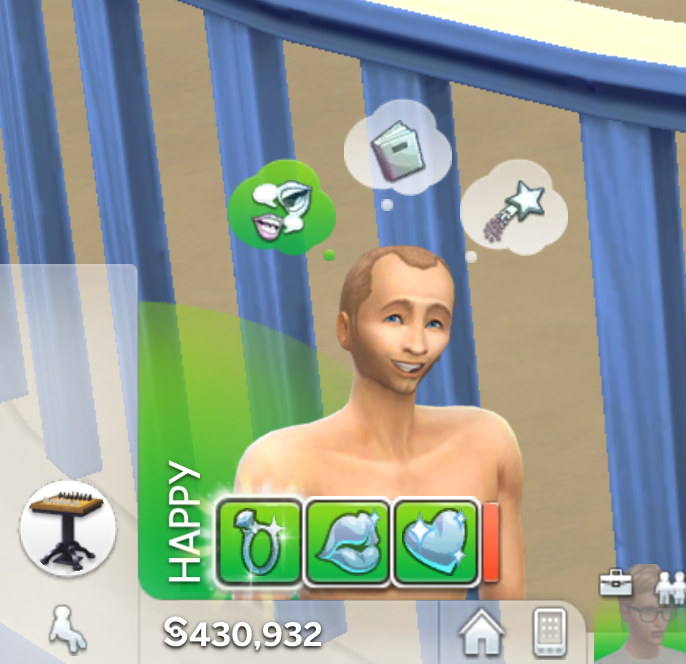 The Sims I created for me and my husband are way less bratty and indignant that any Sims from the original, 2, or 3 ever were. What I mean is they are open to earning skill points more often, have smarter free will (they actually WANT to solve their own problems, imagine that! ), and seem to want to succeed in life. It’s actually kinda inspiring to watch them try to achieve their dreams even when I just want them to go to sleep. Cuties. I was prepared for the worst, because this game has been dragged through the mud by some of my friends and some review sites. I would be brutally honest if I were disappointed, but so far it’s my favorite Sims title yet. Call it the LOW expectations I had, or being a late adopter, but I’m shocked and delighted by how polished and fun this game is. It doesn’t feel like an incomplete base game thirsty for expansion packs, like all the other The Sims base games felt. So while I’m excited to see all the expansion packs to come (the current one out, Get to Work, doesn’t strike me as worth the money), I think I’d be fine with just the base game. I’ve been playing for four days and have only scratched the tip of the iceberg (is that how that phrase goes? Honey, I don’t know…). This game comes highly recommended. Any game that lets me get engaged to my wonderful husband again is an A+ in my book!